Audi RS3 Performance, Engine, Ride, Handling | What Car? 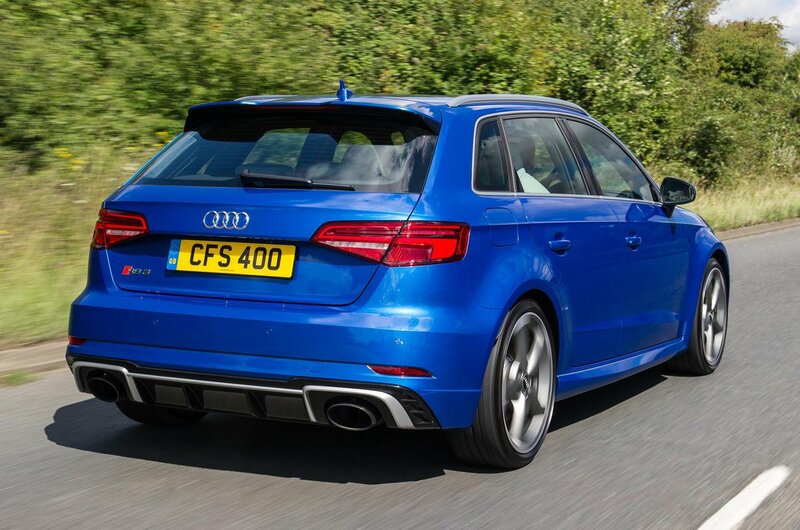 With 354lb ft of pulling power available from just 1700rpm, the RS3 is seriously quick off the mark. It gets to 62mph in a claimed 4.1sec – a figure that feels entirely achievable from behind the wheel. Indeed, there are few cars on sale in any class that are capable of such effortless performance. That said, once you're on the move the RS3 doesn’t deliver the same high rev rush that you get from a BMW M140i or a Honda Civic Type R. The fact the engine is so strong at low revs means there's little reward for revving it hard, apart from the glorious noise it emits if you've ticked the sports exhaust option. The only gearbox available is a seven-speed dual-clutch automatic labelled S tronic. With Dynamic mode engaged on Audi’s Drive Select system, gear changes are fast without being jerky, although we did find the car occasionally unwilling to downchange when in manual mode. In less aggressive drive settings, the gearbox is mostly smooth, but it can be hesitant in traffic or if you suddenly put your right foot to the floor. Happily, the engine is relatively light, which is good news for handling. With minimal weight over its front wheels, the RS3 turns into corners with more zest than the car it replaces. Where that would slide wide during fast cornering, the new car stays locked onto your chosen line. And you can even persuade the rear to step out slightly under power. 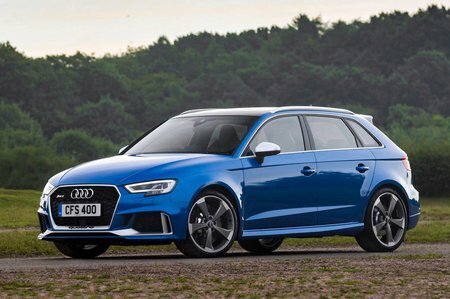 Just don't expect the RS3 to match the best hot hatches when it comes to driver involvement. You may be able to cover ground at an unbelievable rate, but the steering still offers little to no feedback and the car is almost too capable. It doesn't challenge you in the way that the M140i and Focus RS do, and can instead be driven hard almost instantly. More positively, the RS3's standard suspension strikes a decent balance between body control and comfort. Yes, you’re always aware of bumps, but the car seems to move with the road rather than fight against it, while body roll is minimal. Tick the box for the optional adaptive dampers and you’ll find Comfort mode is significantly, well, comfier, whereas Dynamic mode is too firm for most British roads. Aside from some road noise up at motorway speeds, the RS3 is quiet enough at the legal limit. There's very little wind noise, and switching the Drive Select system to Comfort keeps exhaust drone to a minimum.